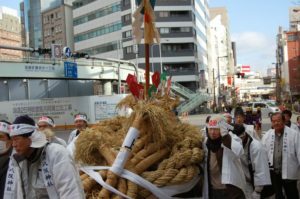 Tsunahiki Shingi festival is a unique local festival held at the Yasaka shrine in Namba, Osaka, taking place every year on the 3rd Sunday of January. 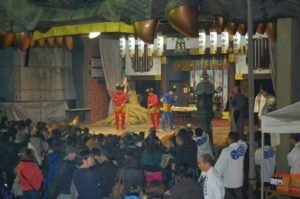 The festival is a representation of the mythical fight between Susano’o, a Shinto storm god, and a giant serpent called Orochi. For those who are fans of Marvel movies, the Thor vs. Jormungandr battle would be a close comparison. 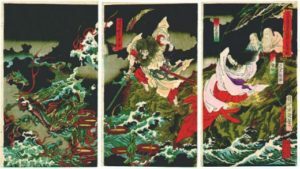 In the mythical story, the god Susano’o, after descending from heaven, came upon an old couple and their daughter. The couple was devastated, crying their eyes out. The god, having nothing better to do, asked them, “Why are you crying?” The couple told him that they originally had eight daughters, but a giant serpent had been coming to devour one daughter, once every year. And the time had come for their last daughter, Kushihime. 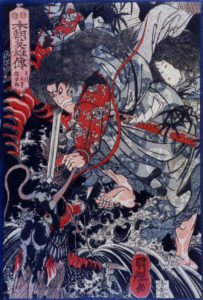 Susano’o proposes to kill the serpent for the family, and in exchange, the girl has to marry him. Not being a rather difficult choice, to marry a god or to be eaten alive, she chooses to marry. Susano’o then does a few tricks with sake and kills the serpent, and then marries the girl. The Yasaka shrine itself is an interesting place to visit. 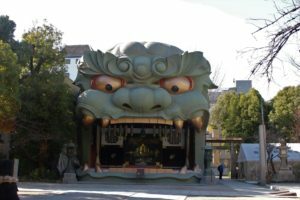 Originally built around 1069, before the rise of the Samurai as a powerful force, the shrine has an enormous 12-m tall statue of a lion head! 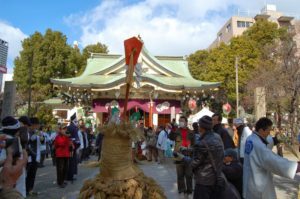 Yasaka shrine is also known as the lion shrine. 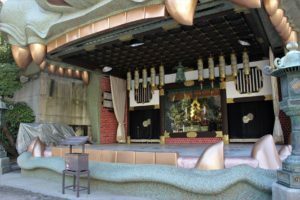 The mouth of the lion serves as a stage, where many events are held, and it is said that visitors to Yasaka shrine who stand in the lion’s mouth will receive good luck. PS: don’t try this with real lions! 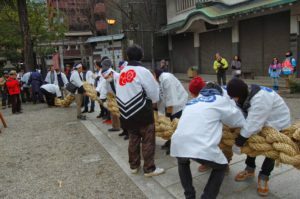 Before the actual Tsunahiki Shinji festival is held, large ropes have to be braided together, an intense task that takes several hours. 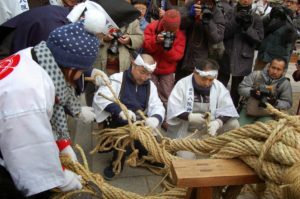 The center of the rope is made into a thick knot, which symbolizes the serpent Orochi’s heart. Apparently, this knot should only be tied by women, as a young woman has a central role in the myth. 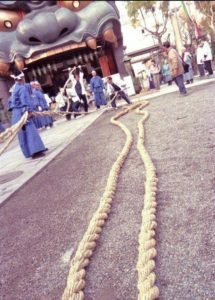 The completed rope is about 30m long and weighs about 300kg! 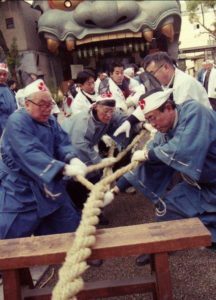 The tug-of-war starts after a paper banner is inserted into the rope’s “heart”, at which point the two teams begin pulling the rope in opposite directions. If you have the chance, don’t miss this festival! Photos courtesy of Yasaka Namba Shrine.